Editor’s Note: There aren’t a lot of policy issues that unite Sarah Palin and Clinton labor secretary Robert Reich. But in Palin’s home state of Alaska, both agree that oil tax revenue should be used to pay equal dividends to all state residents, as it has been since 1982. Alaska’s mineral resources are owned by the citizens of the state. There’s no income or sales tax; oil tax revenue makes up for it, comprising the largest portion of the state’s general fund. In 2007, Palin signed into law a progressive tax collection structure based on the price of oil. That’s no longer the way oil tax revenue is collected for the Last Frontier State’s general fund, though, and last week, voters there rejected a ballot initiative that would have made it that way once again. Instead, voters decided to stick with the law passed by current Republican Gov. Sean Parnell in 2013, which ended the progressive nature of tax collection and cut the base tax rate for oil companies from 35 to 25 percent under the theory that higher taxes were discouraging higher oil output. The No On One campaign, funded mostly by three big oil companies, outspent the defenders of the Palin law by about 10-to-1. Gov. Parnell’s law, which took effect January 1, is expected to cut tax revenues by $2 billion. Non-labor income, like Alaska’s oil tax revenues, now represents a third of every dollar Americans receive, and it’s a good thing, argues entrepreneur Peter Barnes, because the jobs our economy is creating aren’t enough to sustain the middle class. 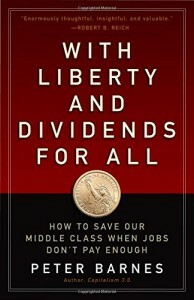 Yes, much of that non-labor income comes in the form of inheritances and capital gains that benefit the ultra rich, but in his new book, “With Liberty and Dividends For All: How to Save Our Middle Class When Jobs Don’t Pay Enough,” Barnes argues for a national dividends program like Alaska’s that could distribute to all Americans as much as $5,000 per year in legitimate property income. Listen to any politician and you’ll hear bold promises to create jobs. Implicitly, our politicians (as well as most economists) assume that jobs can save our middle class, and that given enough incentives, profit-seeking entrepreneurs will create them. Leave aside the fact that creating millions of new jobs in a globalized, automated economy is a lot harder than it sounds. The deeper difficulty with the jobs panacea is that crappy jobs won’t sustain a large middle class — and most of the jobs we’re creating these days fit that description. In the heyday of America’s middle class, jobs at IBM and General Motors were often jobs for life. Employers offered decent wages, health insurance, paid vacations and defined pensions. Nowadays, such jobs are rare. Workers are expendable — often they’re literally “temps” — and their benefits are shrinking. And that’s unlikely to change. It’s also unlikely that the jobs of the future will pay more (adjusted for inflation) than today’s. In unionized industries like autos and airlines, two-tier contracts are now the norm. This means that younger workers get paid substantially less than older ones for doing the same work. Nor is the picture brighter in other industries. In the Labor Department’s latest list of occupations with the greatest projected job growth, only one out of six pays over $60,000 a year. The question that leaps from these numbers is: where are the millions of good-paying jobs that are needed to sustain a large middle class? The Labor Department doesn’t say. Nor does anyone else. Fortunately, labor income doesn’t exhaust our middle class’ possibilities. Since 1980, the flow of non-labor income in our economy has grown to around a third of every dollar Americans receive. It flows into its recipients’ bank accounts as dividends, interest, capital gains and inheritances, among other things. At the moment, the lion’s share of this income goes to the top one percent, but that needn’t always be the case. The question that needs to be asked is: from where might the middle class get some non-labor income? There are two possibilities. One is to raise taxes on the rich and distribute the revenue using some kind of means test. The other is to pay equal dividends to all from wealth we own together. The first approach is a form of income redistribution; it takes from those who’ve already received and gives to those who haven’t. The second is a form of predistribution; it allocates income more fairly in the first place so there’s less need to redistribute later. Here’s how the latter approach could work and why it would be preferable. Dividends could come from a nationwide fund similar to the Alaska Permanent Fund, which, since 1982, has used the state’s oil wealth to pay equal yearly dividends to all Alaskans. Revenue for a national fund could come from a variety of shared assets, starting with our atmosphere, that are currently given away for free. Over time, according to my calculations, such dividends could grow to about $5,000 per person per year. As in Alaska, they wouldn’t be welfare but legitimate property income. Why dividends for all as opposed to, say, higher taxes and means-tested tax credits? One reason is that dividends wouldn’t come from taking people’s already-received income; they’d come from fees paid by businesses for value received. And often, these fees would have ancillary benefits, such as curbing the emissions that cause climate change. Thus, a bill recently introduced by Rep. Chris Van Hollen, D-M.D., would generate money for dividends by auctioning a steadily declining number of carbon permits. Another reason is political. Need-based benefits necessarily divide society into two camps, higher-income payers and lower-income receivers. The former resent that money is taken from them, while the latter resent being viewed as welfare recipients. No one is happy with the arrangement. The chief argument against universal dividends is that they’d be wasteful. Why give Bill Gates money he doesn’t need, for example? The reason is that if the aim is to sustain a broad middle class, excluding the richest few percent saves only a small amount of money. Better to include everyone, including children, and to tax the dividends at everyone’s marginal rate. A national dividend system would be simple, fair and immensely popular. It would rest on the principle of shared ownership, not redistribution. Once set up, it would be market-based rather than tax-funded. And it could gain support across the political spectrum: conservatives from Sarah Palin to Bill O’Reilly have lauded Alaska’s dividends. We should, of course, do everything possible to create jobs and raise wages in our economy, but we must face the fact that labor income alone won’t sustain a large middle class in the foreseeable future. Our times demand a reliable flow of supplementary income as well. The best way to provide that is to pay dividends to everyone from wealth that’s logically ours. Left: Oil tax revenue funds Alaska's Permanent Fund, which distributes dividends equally to state residents. Peter Barnes wants a nationwide dividend system based on shared assets like our atmosphere. 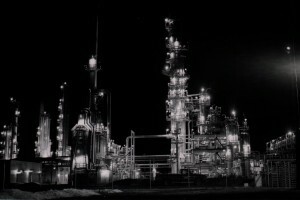 Photo of Alaska refinery by Flickr user EricaJoy.